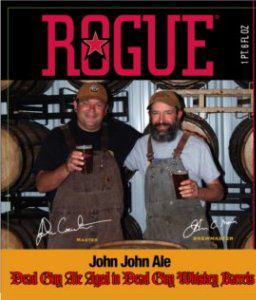 I am a fan of both Rogue’s Dead Guy Ale and barrel aged beers, so when I saw Rogue’s John John Ale sitting in the local store, I had to pick up a bomber of it. John John is basically Dead Guy Ale that has been aged in whiskey barrels for at least two months, so it definitely seemed like something that would be right up my alley. When poured into a glass, this ale has a hazy copper look to it and a nice whiskey smell. The initial tasting has light whiskey notes, but also a much sweeter taste than I expected. The whiskey flavor becomes more prominent as the glass grows lighter, which I am appreciative of. Unfortunately, that’s about it when it comes to flavor. There is a slight detection of oak and maybe a little vanilla, but the barrel dominates everything. This is essentially a darker version of the Dead Guy Ale, but it is a bit too “one note” for my liking. John John Ale is not a bad beer at all, but it is a bit disappointing in terms of barrel aged options. If you want a stronger Dead Guy, I would advise the Double Dead Guy Ale.